But back to beans. I thought, with time, I would become inspired. That something would leap out one day and shout that this was it, this was exactly the right recipe. That happens sometimes, especially with food. And writing. A moment of creativity in which everything makes sense without any effort. A fully-formed idea comes into your mind and you know that it’s exactly right. But not this time. 1. Slice the bacon, cross-wise. Place in an unheated cast-iron skillet. Turn the heat to medium-high and fry until crisp. Add the onion and cook, stirring, for another 2-3 minutes, until the onion is soft. Season generously with freshly ground black pepper and remove from heat. 2. 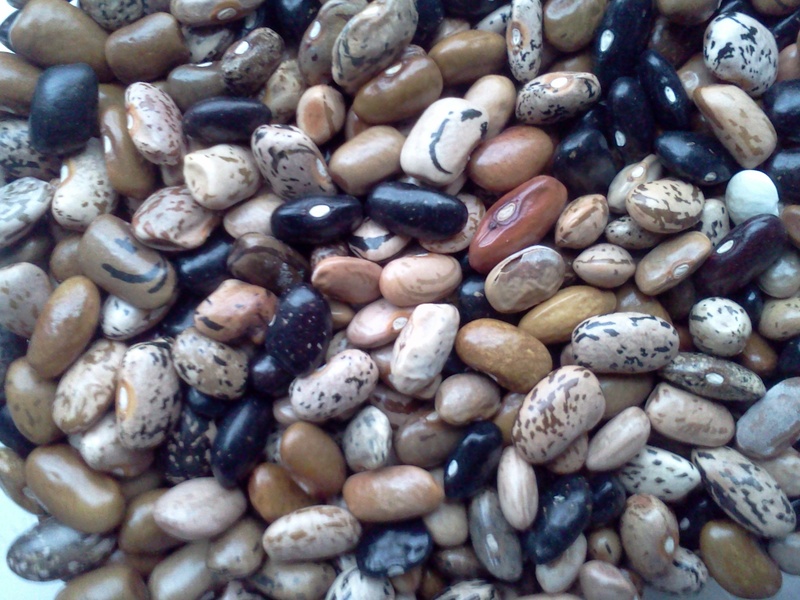 Rinse the beans and pick out any pebbles or bits of chaff. Transfer the rinsed beans to a pot or the insert of a slow cooker. Grind the cumin, coriander, and coffee in a coffee grinder. Add the spices to the beans, together with the kombu, chili pepper, and onion mixture. Add water to cover by 2 inches. If you’re cooking on the stove top, bring to a boil and then reduce the heat to a simmer and cook, uncovered, for 2-3 hours, or until the beans are tender. Check the water level occasionally to make sure the beans are submerged. If you’re using a slow cooker, cover and cook on low for 8-10 hours. When the beans are tender, salt generously (about 1-1/2 t) and allow the beans to cool in the liquid. I ate these beans with tortillas and sliced avocado. But you could also serve them over rice, for a gluten-free meal. They would probably also be good without the bacon, for all you non-meat eaters out there. The bacon is really good though. And I love that it takes so little to make such big flavor. The longer I stretch it, the fewer pigs die for my pleasure. Thank you, pig. I am grateful.